On a day that saw winds gusting to above 20 knots, Groupe Edmond de Rothschild is finding her best form of the season, and leads into the Extreme Sailing Series Rio finale tomorrow on 144 points, but with The Wave, Muscat still in touch on 138.2 and with overall championship victory firmly in her sights. Leigh McMillan's team found their best form of the regatta so far, the team enjoying the bigger conditions. However their day was marred when local heroes, Team Brasil, skippered by Torben Grael rammed them from astern on the first beat of the penultimate race. As the British skipper of th Omani boat recounted: "We were sailing on starboard up to the exclusion zone. There was a string of two or three boats up to windward of us, so we asked for room to tack and everyone said 'you tack' so we went for the tack and Torben just sailed into the back of us and caused quite a bit of damage and someho Hashim got injured. We had to get him on to the safety boat. He was being sick on the boat. He wasn’t in good shape at all..."
Their Omani bowman Hashim Al Rashdi was rushed ashore where he was seen by some medics and has since been given a clean bill of health. Meanwhile The Wave, Muscat managed to rapidly find a replacement bowman in the form of course marshal, Tom Buggy. "He works for OC but he has done bow a few events over the last couple of seasons," said McMillan. "He had to adapt very quickly to how we do it, but fortunately we weren’t under too much pressure on the boat handling in that race and it didn’t cost us anything." Unable to finish that race The Wave was awarded average points. Fortunately damage was limited to breaking the tiller extension while McMillan thought that there might be some other issues with the steering that they would have to investigate tonight. With the bit between her teeth today, The Wave, Muscat performed well McMillan thought, and finally secured their first bullets of the regatta - in fact three of them. However the class act of the last two days has been Pierre Pennec's team on Groupe Edmond de Rothschild. Pennec’s sights are firmly set on a win in Rio, although he is realistic about the fight for the 2012 championship. “Tomorrow will be a real battle, and I hope the conditions will be as good. We work well on board and have good crew communication and good boat speed. I would like to be on top of the podium for Rio and second overall in the championship”. The fight is on for the third place on the podium between Morgan Larson's team on Oman Air and double Tornado Olympic gold medallist, Roman Hagara on Red Bull Sailing Team, separated by just a point going into the final day. 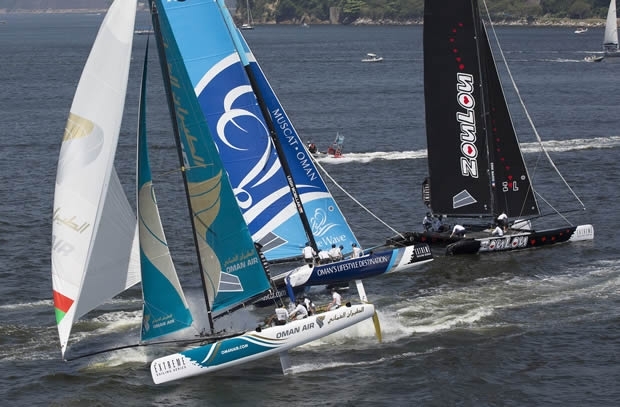 While Oman Air's didn't have any disasters on the race track other than snagging a course mark at one point, they were slightly too 'mid-fleet' for their skipper's liking. "Below average," was Larson's assessment of the day. "We got caught up in traffic a lot and I didn’t keep it clean enough and we got bounced around in the middle. Unfortunatley Gitana had a good day so we are in this position. Everybody was sailing their boats well and we just didn’t find our way and it was shifty and a little bit unpredictable. We can’t blame it on anything but ourselves. We’ll get back on it tomorrow." The final day of racing gets underway at 1600 UTC in Rio tomorrow with live coverage from 1700 UTC - watch this here.